The Philips AVENT travel cutlery set is a great solution for mums when they are out and about. 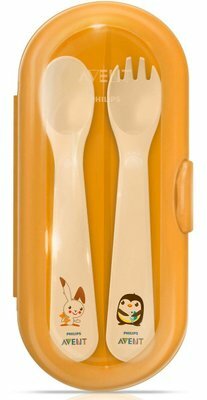 This weaning cutlery set comes with a deep-scoop spoon and fork, suitable for little ones from 12 months +, and a travel case to help keep the cutlery hygienic on the go. This Philips AVENT easy-grip cutlery set is specially designed little hands and for learning to self-feed. The non-slip handles allow for easy grip and can rest on baby's bowl without sliding. The entire case can be sterilised for hygiene purposes and is dishwasher safe for convenience.